Before the United States even existed as a country, it was the Native Americans who soaked their bones in earth’s thermal springs. Scattered mostly throughout the western half of the USA, these sacred pools remain in the deserts and mountains, surrounded by towering palm trees and the wild weeds of the west. Today, some have even been built up into wellness resorts while others remain hidden in the woods. Perfect for cleansing, healing, and rejuvenating your body, mind, soul, and spirit, here are a few of our favorite natural hot springs to visit in the USA. Tucked behind Douglas firs and on the banks of a babbling river, Breitenbush Hot Springs is the place to experience the kind of rest and rejuvenation gifted only by time spent in nature. Located 100 miles southeast of Portland, these hot springs vary in temperature, and there is an adjacent deep cedar tub filled with cold water for a post-soak plunge. Clothing is optional in the pools, and a designated quiet pool allows for uninterrupted silence and contemplation. Breitenbush offers more than natural pools for soaking though. The 154-acre grounds is also a family-friendly retreat center for personal stays, as well as organized wellness events and activities. Pair your time at the pools with a massage, yoga class, visit to the onsite library, or organic vegetarian meal. There are also nearby hiking trails for exploring Oregon’s ancient forests and a labyrinth for meditation, as well as lodging options for longer stays. We recommend booking one of the 1930s rustic cabins, upgraded with geothermal heat. Want to submerge your body in waters that have been flowing beneath the earth’s surface for more than 600 years? You can at Two Bunch Palms—a world-renowned resort tucked in the dusty Coachella Valley of California. The thermal pools are filled with waters from famed mineral springs descending from Miracle Hill and, with mood-enhancing properties due to the water’s rich lithium and low sulfur contents, it’s a literal refuge in the desert. 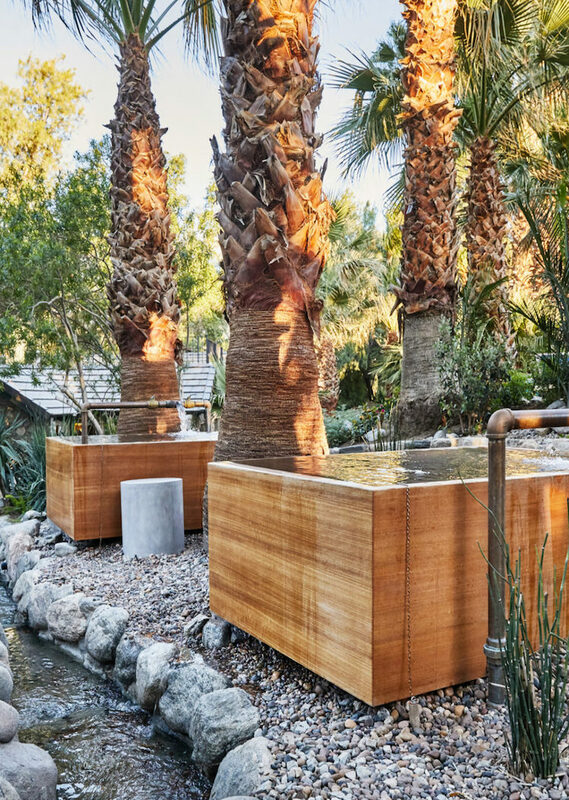 Guests at Two Bunch Palms will find various pools for soaking, including teak tubs with adjustable temperatures and concrete-pools brimming with naturally-warmed waters. Soaks can also be paired with spa treatments—we recommend the desert detox clay wrap or a chakra balance massage. For those who wish to stay overnight (or longer), luxury rooms are scattered throughout the property beneath giant tamarisk trees. There is even an onsite restaurant boasting a menu of dishes crafted with local produce. Two Palms is also the first carbon-natural resort in the United States. Electricity is generated solely from renewable sources and water is recycled for irrigation. Remember Dunton River Camp from our article about the best spots to go glamping in the USA? Well the ghost town just outside Telluride, Colorado also boasts one the country’s most unique natural hot springs. Described as a place where Native Americans, and then miners, soaked and lazed in the landscape’s natural waters, Dunton Hot Spring’s waters are as rich as the town’s history. Day guests can use the hot springs at Dunton, but we recommend booking an overnight stay in one of the hand-hewn, authentic log cabins for the most restorative experience. Only steps away from the bathhouse and a saloon (legend has it Butch Cassidy had a drink here after robbing his first bank), this off-grid mountain getaway is anything but rustic. A soak in Goldbug Hot Springs is a truly transformative experience. It’s also one you have to work for. Tucked in the backcountry of Idaho’s high desert, these waterfall-fed pools require visitors first to hike up two miles of exposed switchbacks. The reward is more than worth it though. After a grueling uphill climb, the hike culminates with a chain of six or more geothermal pools that vary in temperature—a few moments in these hot springs can rejuvenate even the most exasperated hiker. If you plan to visit, make sure to bring along water and sunscreen for the trek. Suits are optional, although the park states that most visitors choose to bathe au naturel. It should also be noted that, despite the treacherous hike and seclusion of these pools, Goldbug is known to attract crowds. For the best chance at a secluded soak in nature, we recommend camping overnight at one of the nearby plots and taking a dip in the early hours of the morning. Alternatively, visit during the winter months for a secluded and memorable experience. There are two Ojo Spa Resorts located in northern New Mexico: Ojo Caliente in Caliente and Sunrise Springs in Santa Fe. Both offer sacred wellness experiences, and both invite guests to soak in in the land’s healing hot springs and mineral-infused waters. At Ojo Caliente, there are a handful of geothermal springs, as well as three private outdoor mineral pools, complimented by Kiva fireplaces, and private soaking tubs in the main bathhouse. Each pool offers a unique healing experience (for example, the water in the Iron pool benefits the blood and immune system), and many are even family-friendly. A variety of spa treatments and healing therapies rooted in ancient practice and tradition are also available for booking. Make sure to try the signature Milagro Wrap—a dry blanket wrap that encourages your body to release toxins. Sunrise Springs is Ojo Caliente’s sister property and is an equally luxurious and nurturing spa experience. Located in the La Cienega Valley (ciénega is Spanish for ‘desert marsh’), this resort is an oasis of natural springs and protected waters. Spend the day floating beneath cottonwoods in a mineral-infused private pool and then relax in the eucalyptus steam room. And be sure to take your fill of tap water—the well water at Sunrise Springs is potable and nourishes from within.